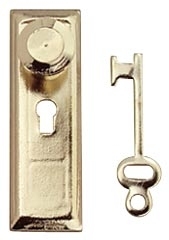 Brass Knob with Key plate and key. Plate and knob are one piece. Two plates per package. 1-inch scale. Made of gold-plated brass. Measures 3/4 inch in length.